Dennis awoke to the sound of his violently chattering teeth. His fingers and toes were aching from cold, despite the strange, soft warmth that was pressed against his body—directly against his skin. The warmth wasn’t normal, not like a blanket. It was smooth and hot and—alive. Dennis opened his eyes in a rush of panic and stared out into the darkness. As his sight adjusted, no more than six inches from the tip of his nose, he saw what looked to be a face. Dennis’s heart began to stir as his stomach shrivelled and knotted. The face belonged to the boy from the woods, and he was just as naked as Dennis. The boy slept soundly at Dennis’s side, huddled beneath a thick, fur blanket, with his left arm wrapped snuggly over Dennis’s shoulder and their legs interwoven and locked. Dennis wasn’t sure what to do, how to react, or if this feeling was fear or excitement. He couldn’t move, either, and constantly had to remind himself to breathe. The boy, up close and past the dirt, looked just like any other boy, yet Dennis knew that he wasn’t. He had lived alone in the woods, with no television or Internet or music or friends throughout his entire life. He didn’t know what it was like in the real world—the good, the bad and the downright disturbing—but that was part of why Dennis found him so intriguing. Unfortunately, as much as Dennis tried to imagine it, he couldn’t seem to grasp what it must have been like to be alone in the woods for such a long time. Out of nowhere, the boy opened his eyes and stared at Dennis. Dennis gazed back nervously as the boy stirred at his side, until the sensation of something hot and stiff jabbed against his abdomen, causing Dennis to blush and look away. But the boy just smiled at him and reached under the thick, furry blanket that covered them both and grabbed hold of Dennis’s arm. The boy brought Dennis’s hand in front of his face and examined his fingers. They were red from the cold but not frostbitten, which seemed to please the boy as he reached for Dennis’s other hand. “I’m okay,” Dennis said in a shaky croak. But the boy didn’t pay him any attention and disappeared under the blanket, shifted around and then crawled to Dennis’s feet to inspect his toes. The very moment the boy grabbed his feet, Dennis started to laugh and kicked to get away. The boy poked his head out from the other end of the fur and looked at Dennis. “Better?” he asked sincerely. Dennis nodded as he curled his knees toward his chest and wrapped his arms around them. “Where are my clothes?” he asked. “Wet,” answered the boy, and he pointed to Dennis’s right. The boy raised an eyebrow. The boy grinned and gave Dennis a nod. But the boy just looked at him curiously. “Dennis!” the boy shouted happily as he snatched the blanket and pulled it snuggly against his chest before closing his eyes, smiling and rubbing his cheek against soft fur. Adam glanced at Dennis’s hand and then looked up at him quizzically. “Uh… you shake it,” explained Dennis, reaching closer to the boy. Adam smiled and took Dennis’s hand in his own then shook it from side to side. “That’s, uh, good enough.” Dennis giggled and released Adam’s hand so that he could readjust the blanket around his waist and take in his strange surroundings. “You should come back with me,” he offered hopefully. Adam didn’t acknowledge Dennis’s words and instead started to get himself dressed. Still, Adam didn’t answer, causing Dennis to wonder if he could even understand him. He watched the boy closely as he stood up, naked, facing away from him, and Dennis couldn’t help staring at Adam’s body. Beyond the grime, Dennis could see scars scattered up his back and down his legs. In some places there were even scars over scars, and it made Dennis’s heart fill with sadness for the boy. “How did you…” Dennis stopped to think of how to phrase his question so that the boy would understand, but nothing came to him. Adam turned around and looked at Dennis as he wrapped a string around his waist to secure his hand-stitched pants, made from some kind of animal’s hide. He looked at Dennis intently, as if waiting for him to finish, and then sat down in front of him and crossed his legs. Dennis smiled and shyly looked into Adam’s eyes. The first time he had seen them Dennis thought they were hazel, but a closer look proved them to be closer to green with a few dark specs along the outer iris. It wasn’t long before Dennis felt that his staring was becoming awkward and he looked away and blushed. The moment he did, however, Adam reached for his chin and guided Dennis’s gaze back to his own. The boy smiled at him and giggled, and before Dennis knew what was happening, Adam leaned forward, threw his arms around him and planted his face against the curve of Dennis’s neck and shoulder. Dennis wasn’t sure what to do at first. Adam was sniffing him. He could feel the air moving in and out of his nostrils, tickling his skin, as the warmth of the boy’s body absorbed into his own. After careful consideration, Dennis reached his arms around Adam and hugged him back. He knew that boys weren’t supposed to hug like this, but Adam, after all, wasn’t exactly your normal, everyday boy. As soon as Dennis’s hands made contact with the boy’s back, Adam squeezed him tighter and sighed happily. Dennis could tell that Adam hadn’t touched someone else in a long time, if ever. The boy was literally quivering in his arms, just like a scared animal would. But this was different, Adam didn’t want to let go. He was holding on tight, his hands locked behind Dennis’s back, as if he was afraid that Dennis would disappear if he loosened his grip. In turn, Dennis reassured the boy by squeezing him back and holding him tight against his chest. This seemed to help, as only seconds later Adam’s grip eased and he started to slide his fingers up and down Dennis’s back, causing Dennis to shudder as his body rippled with goose bumps. At the same time, Adam was humming happily as he sniffed Dennis’s skin with his lips pressed firmly against his shoulder. Adam stared at Dennis for a while, looking right into his eyes, and then turned around and started crawling down the short tunnel and disappearing in the snow outdoors. In only a few short seconds, the boy returned with Dennis’s clothes and placed them down in front of him. They smelled of smoke from the fire but were almost completely dry. Adam just smiled at Dennis and then turned back around to retrieve his own clothes. “Thanks,” said Dennis as he sorted through his pile, retrieved his boxer-briefs and slid them under the blanket so that he could dress in privacy. As Adam finished dressing he turned to Dennis, who was struggling with his pants, and offered him his hand. “I take you,” he said and waited for Dennis’s hand. Dennis didn’t quite have his pants on yet, but he let Adam help him up anyway. “Thanks,” he repeated as he clumsily fumbled to pull up his sweats. He wanted to ask Adam if he’d stay, even if just for a while. He had seen a part of Adam’s world, and now he wanted to show Adam part of his. They were getting close, Dennis could feel it. His surroundings were becoming more and more familiar and Adam seemed to be getting anxious. Dennis didn’t blame him either. Half the town was still searching for him and Dennis knew it was all his fault. If he hadn’t said anything to anyone, if he had been braver, then Adam would still be free to live in peace. But Adam wouldn’t move. He just stared into Dennis’s eyes, his own becoming glossy with moisture, and said nothing. “I’ll stay with you,” he promised and squeezed Adam’s hand to reassure him as he slowly began to step backward, toward the house. Dennis stepped back and reached for Adam’s hand before slowly turning around and guiding him out into the back yard. With every step they took Adam’s grip on Dennis’s hand seemed to get tighter, but Dennis didn’t mind. He knew that once Adam got inside and saw what his life could be like that he’d want to stay for good. Adam stopped at the steps and let go of Dennis’s hand. “What’s the matter?” Dennis asked in an attempt to comfort him. The boy stared down at the step and then looked back at the trees. Adam released Dennis’s hands, grabbed the front of his jacket, and then pulled him close against his chest before wrapping his arms tightly around his waist. The boy was trembling, only this time it was out of fear, and Dennis wasn’t sure what else he could say. So instead of trying to convince him, he hugged him back and squeezed him tight. But the boy didn’t back away or even move. Instead, he continued to sniff as he pressed his lips against Dennis’s neck and slid them from side to side so that he could feel the smoothness of Dennis’s warm skin. And that’s when it happened. Adam stepped forward, up onto the first step, and continued up the remaining stairs to the deck. Soon they were at the door, but Adam wouldn’t look up. He remained still with his hands gripped tightly and face firmly planted against Dennis’s jacket, even as Dennis opened the door and guided him inside. “Where the heck have you been? !” said Dennis’s mother, attempting to scold him. “We’ve been…” Mrs. Hayes stopped and stared at the strange boy attached to her son, who was still hiding his face against Dennis’s jacket, and she stopped so fast in her tracks that she nearly fell over. “No, Mom, I didn’t. He told me,” explained Dennis, noting his mother’s baffled expression. But the boy wouldn’t budge from his chest, leaving Dennis to have to try and carefully pry him away. However, the moment he had distanced himself from Adam by only a few inches, the boy snatched himself back and held on even tighter. With that said, Dennis awkwardly wiped his boots on the doormat and slowly shuffled himself and Adam toward the kitchen table. 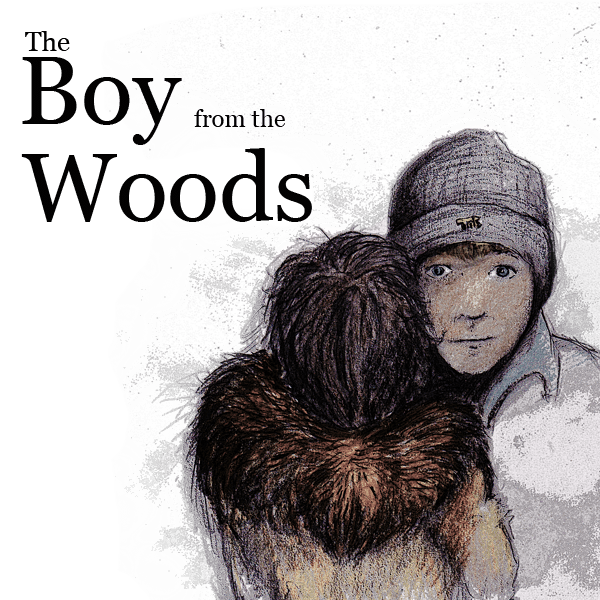 During this time, Mrs. Hayes had released Keegan, who immediately ran to his brother’s side to get a closer look at the strange boy from the woods. The tugging caused Adam to turn his head and he bravely opened his eyes to see what was happening. When he saw Keegan’s big, bright eyes looking up at him, Adam loosened his grip on Dennis and stared down at the younger boy. When the two made it to the table, Dennis placed his hands on the sides of Adam’s arms and slowly moved back. “Sit?” suggested Dennis as he gestured his eyes toward a chair. “Chair.” Adam eased away from Dennis and moved behind the chair. He studied it carefully as he moved this hand toward the top of the backrest and prodded it with his finger. “Like this.” Dennis waited for Adam to turn his attention back to him before he pulled out the chair and sat down. “Sit,” he repeated with a smile. Dennis nodded again as Adam stepped to the side of the chair, placed one hand on the backrest and the other on the table, and carefully eased himself down. Seconds after being seated, Adam grinned and looked up at Mrs. Hayes. “Sitting,” he said and, without warning, started to laugh. Adam didn’t stop laughing. In fact, he laughed louder. His face turned red and eyes became watery and soon it became infectious. Mrs. Hayes was first to snicker, and she placed her hand in front of her mouth to hide it, just in case it offended the boy. But then Keegan started and Dennis was quick to follow. They couldn’t stop, despite not knowing why they were laughing to begin with, and their cheeks were quickly getting tight and sore. Keegan was laughing so hard that he had to rush to the washroom before it was too late, just as three loud knocks echoed down the hall from the front door. Mrs. Hayes wiped her eyes with the sleeve of her shirt and took in a long, deep breath to try and regain her composure as she started to walk to the door. However, Keegan ran ahead and swung open the door before she was even halfway down the hall, stared up at the tall man now standing in front of him and immediately stopped laughing.